BMW has finally set a U.S. launch date for its plug-in hybrid 3-Series variant. The plug-in hybrid was briefly mentioned during BMW's unveiling of a mid-cycle refresh for the entire 3-Series lineup last year. Then a European-spec model was unveiled at the 2015 Frankfurt Motor Show back in September. Now, we have confirmation that the 2017 BMW 330e iPerformance will go on sale in the U.S. late this summer. 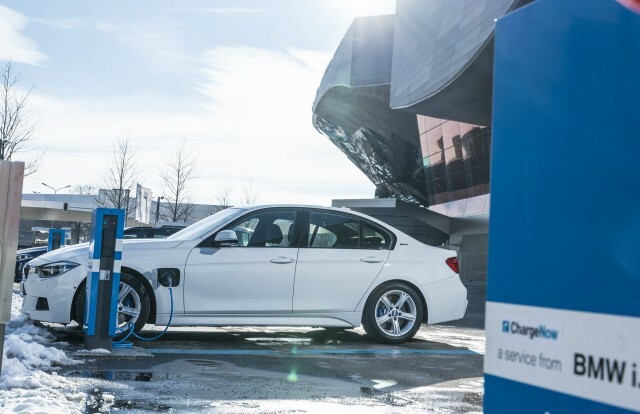 Since the 330e was first shown, BMW has begun adding the "iPerformance" tag to plug-in hybrids based on existing models, in order to tie them to the "i" family of dedicated plug-in models. So the 330e is now the 330e iPerformance, and the previously-revealed X5 xDrive40e and 740e xDrive are now officially the X5 xDrive40e iPerformance and 740e xDrive iPerformance, respectively. The 330e powertrain consists of a 2.0-liter turbocharged four-cylinder engine and eight-speed automatic transmission, working with an electric motor and 7.6-kilowatt-hour lithium-ion battery pack. Unlike the other two iPerformance models, the 330e is rear-wheel drive, rather than all-wheel drive. Total system output is 248 horsepower and 310 pound-feet of torque, allowing for 0 to 60 mph in 5.9 seconds and a top speed of 140 mph, says BMW. Operating solely on electric power, the 330e can also drive up to 14 miles, at speeds up to 75 mph, according to the company. 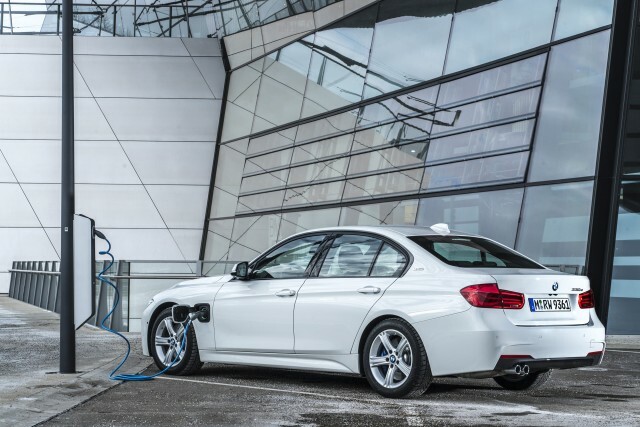 The EPA rates the 330e at 14 miles of electric range, and 31 mpg combined when running as a conventional hybrid. Its efficiency rating is 72 MPGe, or miles per gallon equivalent, a measure of the distance a car can travel electrically on the same amount of energy as contained in 1 gallon of gasoline. 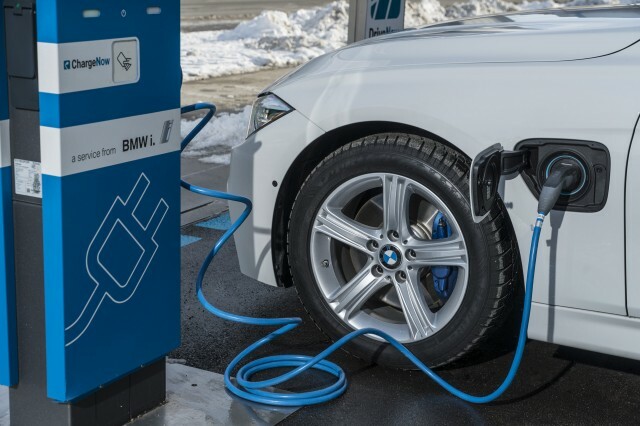 BMW estimates recharging will take 2.5 hours from a 240-volt Level 2 AC source, and six to seven hours from a 120-volt outlet. The battery pack is located under the trunk load floor, which cuts trunk space from 17 cubic feet to 13 cubic feet, but preserves the 40/20/40 split-folding rear bench seat that allows longer items to be loaded through into the back-seat area. Like many plug-in hybrids, the 330e has a choice of driving modes. "Auto eDrive" automatically selects a combination of gasoline and electric power, "Max eDrive" prioritizes electric driving, and "Save Battery" holds battery charge at 50 percent. The car can also use real-time traffic information to plot when it is best to use electric power. 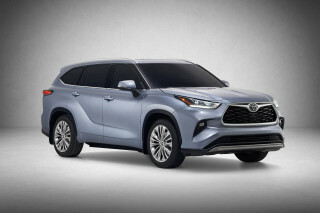 It might, for example, save the charge for driving through urban areas, or to give the gasoline engine an extra boost on hills. All of that comes at a base price of $44,695 (including destination). When it goes on sale this summer, the 330e will join the 7-Series, X5, and i8 plug-in hybrids, as well as the all-electric and range-extended i3s, in a growing U.S. lineup of BMW plug-in cars.